Tetraodon biocellatus are commonly known as figure 8 puffers, a name derived from their head markings (which look somewhat like the number eight). Although they are smaller and easier to keep than most puffer species there are still a lot of misconceptions out there about these fish. They are not freshwater fish nor are they suitable for community aquariums, but don’t let this stop you from keeping them! Keep reading for everything you need to know about keeping figure eight puffer fish. Note: figure 8 puffers belong in brackish tanks. If you’re looking for a freshwater puffer, try having a look at this list. Figure 8 puffers are naturally found in estuaries, mangrove forests and streams in Southeast Asia, where they inhabit calm waters. With a maximum size of around 4 inches (10 cm), figure 8 puffers stay relatively small. Their appearance is quite striking, with a creamy white belly, yellow body and black markings. 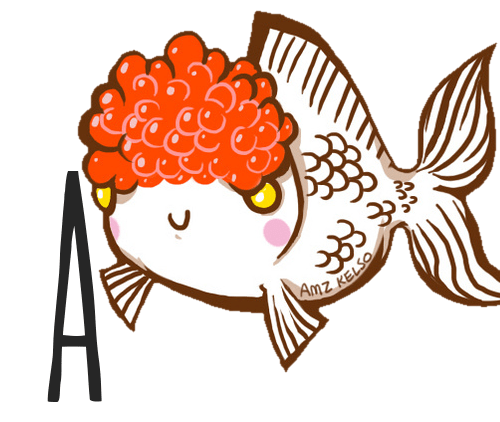 As mentioned in the intro, their common name is derived from the “eight”-shaped marking on their head. Figure eights are sometimes confused with young Ceylon puffers (Tetraodon fluviatilis) or green spotted puffers (Tetraodon nigroviridis), so if you’re planning on keeping one be sure to double check whether you’re buying the right fish! Although they’re one of the easier puffer species, figure 8 puffers (and most others except for the tiny dwarf puffer) are not a great choice for beginning aquarists as they require relatively specific care. For a single figure 8 puffer, an aquarium of at least 20 gallons (75L) with heavy filtration is recommended as they produce a lot of waste and are messy eaters. Although many sites list figure 8 puffers as a freshwater species, these fish will do much better in a low-end brackish aquarium with a salinity of at least around 1.005. Setting up a brackish aquarium can sound intimidating but is actually very similar to starting a freshwater tank: all you need to get started is a proper refractometer and some marine aquarium salt. Like all puffers, figure eights are very easily bored and require a densely planted, well-decorated tank. A bored puffer will spend much of its time “glass-surfing”, swimming up and down the front of the tank. Finding plants that can withstand brackish water might seem challenging but luckily some of the easiest plants in the hobby (like Java fern) can actually withstand a relatively high salt grade and will do fine. You can also add plenty of driftwood and rocks to keep your puffer occupied. Note: if you’re not sure how to set up a brackish aquarium have a look at this article, which contains everything you need to know. Like all puffers, figure eights are very aggressive and the easiest way to keep them is a single-species setup with a single specimen. This prevents any possible trouble with tankmates being nipped at, damaged or even eaten whole. If you do want to keep your figure 8 puffer with other fish there are a few options, although you’ll always have to have a plan B in case things do go south. In large enough aquariums figure 8 puffers can sometimes be kept in groups. You might also be able to succesfully keep them with bumblebee gobies (Brachygobius sp.) and other quick, short-finned fish that tolerate a similar salt grade and temperature. Their diet is one of the most challenging aspect of keeping any puffer and this is no different for figure eights. Pellet and flake foods are not suitable (nor will they be accepted by most puffers). Almost all puffers have teeth that are adapted to hard and crunchy foods and will continue to grow their entire lives to deal with this type of diet. This means that if you don’t offer enough of these foods your puffer’s teeth will eventually overgrow, rendering it unable to eat and resulting in you having to clip them by hand; obviously not a pleasant experience for the puffer in question. Thus, to keep puffer teeth short their diet should consist mostly of crustaceans, possibly supplemented with other live or frozen foods like mosquito larvae and bloodworms. Live foods are a great option: you can breed snails, dwarf shrimp and dwarf crayfish yourself at home. You can also use store-bought frozen mussels, crab legs, clams or shrimp soaked in a vitamin supplement. 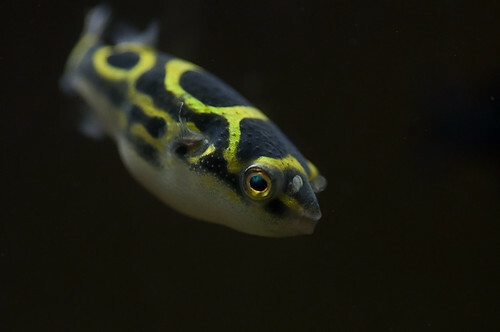 Juvenile puffers can be fed daily, adult fish only need a meal every few days. Note: Malaysian trumpet snails are not a suitable puffer food as their shells are too hard and can cause tooth damage. So why keep figure 8 puffers if they’re such a challenge? Their behavior more than makes up for it. These are one of the most intelligent fish species to be found in the aquarium store: they always seem to be observing their environment, know when it’s feeding time and can even learn to differentiate between their owner and other people after a while. Few things are more amusing than a puffer “helicoptering” in front of an object to closely inspect it (and then possibly eat it)! There have been no reports of figure 8 puffers being bred in captivity so far. If you have any more questions about keeping figure 8 puffers (Tetraodon biocellatus) or if you want to share your own experiences with this interesting and intelligent fish species, don’t hesitate to leave a comment below! Hi, I’ve seen in some places that you can keep these with Bumblebee gobies, is that true, and if so, how many gobies & puffers could I keep in a 120cm long, 45cm deep 55cm tall tank? Hi! I’ve seen this done and recommended in some places as well. I agree it’s probably possible to keep them together though you should always have a plan B for the gobies in case your puffer turns out to be a cold blooded killer. It’s also not 100% the most ideal situation; bumblebee gobies do best in a single-species setup.